It has been a busy time! I last posted in March and we are now to mid-July! In those four months, I have completed the final two drawings for the sketchbook exchange project that I have been a part of for the past year. 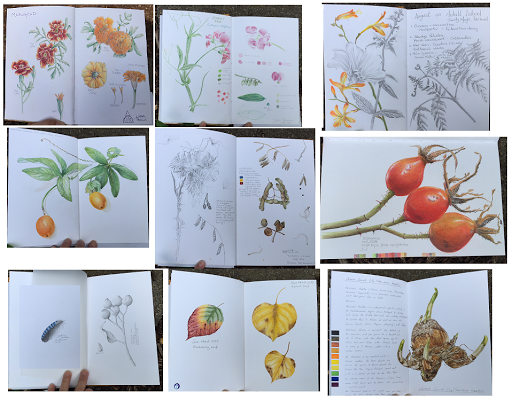 I also moved houses and went on vacation, so I was thrilled, upon my return, to find my own sketchbook back from its last stop in Singapore, filled with amazing artwork from around the world! Here is a peek at some pictures of the gorgeous pieces that fill my sketchbook from seven amazing artists. From left to right (starting in the top left corner): Linda Trella, Giulia Canevari, Elaine Moore Mackey, Beryl Prout (two pages), Mischa (two pages), Sevil Medhi, and Teo Nam Siang. Previous to getting my own book back, I finished up drawings for Giulia’s and Linda’s books. 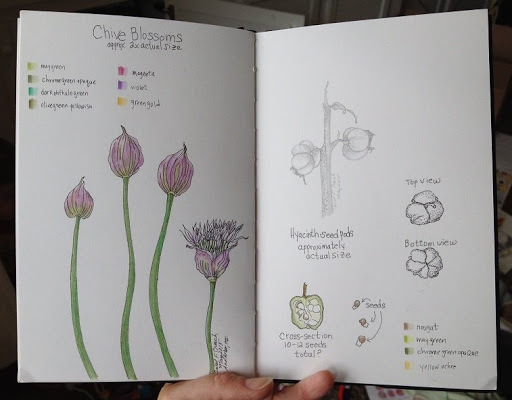 For Guilia’s, I did some ink and colored pencil drawings of the beautiful chive blossoms that were popping up in my old garden. I also found some neat seed hyacinth seed pods to round out the other page (graphite, ink and ink/colored pencil.) I was anxious to get this mailed out before our move and was glad to get it finished. Linda’s book was carefully packed in my bag so I wouldn’t lose it. 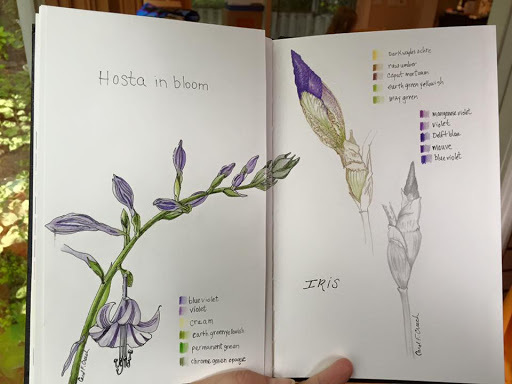 Once we were settled in a bit at the new place, I was able to do some drawings of iris buds that I had from my old garden and then found the perfect finishing touch at the new place once my hostas started blooming. I used ink and colored pencil on the hostas, colored pencil alone on the one iris bud and graphite alone on the other iris bud. Happily, I was able to mail this out to Linda before vacation. A modified group of us (depending on availability, etc.) plan to continue the exchange for a second round starting in August, so stay tuned! Previous Sketchbook Exchange Update – Drawing #6! Next Etsy Shop Update — Need your help!